Rev. Howard E. Jones Jr.
As we begin another year, we are thankful for the many triumphs we experienced during 2016 and years past. We are thankful to have seen yet another year, 2017. Kingdom Café & Grill, an outreach ministry of Fairfield M. B. Church opened with great fanfare and is a significant ministry to the public. In 2016, we faced many challenges. There were countless, needless murders of African American children, and we must work diligently to strive to fashion a way to end senseless violence in all of our communities nationwide. Additionally, we lost many stalwarts in our community from natural and medical causes. The list is far too long. Yet, we remember them and extend love and support to their families. My concern is to focus on second chances. Just as God continues to give us another chance, it is for us to give our fellowman a second chance. At Kingdom Café & Grill, we believe in second changes. We proudly hire, train and support those reformed individuals, who have paid their debt to society and looking for a new opportunity to be vital, productive and good citizens of Metropolitan Nashville, as well as, the State of Tennessee. Often times, we shy away from these opportunities, until it is one of us who needs to help a relative, or need help ourselves. Then we embrace second chances, a job, restoring the right to vote, or simply being embraced by family, friends and the community at large. I believe that God transforms us so that we may transform others. Jefferson Street has a history of being an economic powerhouse in the African American community. 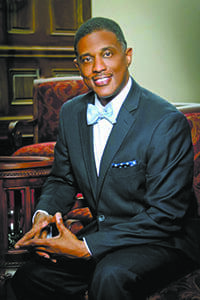 Peppered with businesses throughout the North Nashville area, from Historically Black Colleges & Universities, such as Tennessee State University, Fisk University, Meharry Medical College and nearby, American Baptist College, as well as the Tennessee Tribune newspaper, restaurants, funeral homes, and other businesses, it has experienced growth stagnation. However, I believe Jefferson Street’s history calls forth the spirit of our ancestors, led by the Lord, and as Nashville experiences a boom in growth and development, so too should Jefferson Street and North Nashville, for such a time as this. Its history alone, dictates that it is a special place in Music City, and we have a responsibility to reclaim its greatness.